Detroit January 9th 2017. 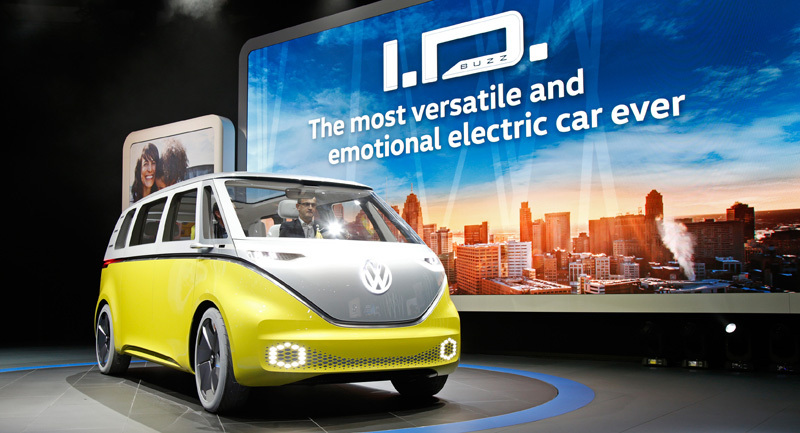 It has been just four months since Volkswagen presented a smaller sibling of the I.D. 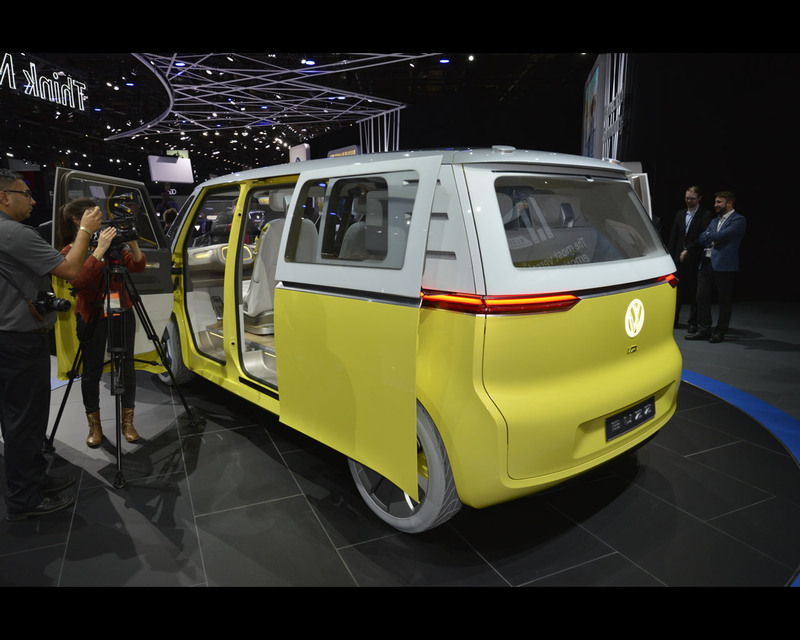 BUZZ at the Paris International Motor Show: the I.D. 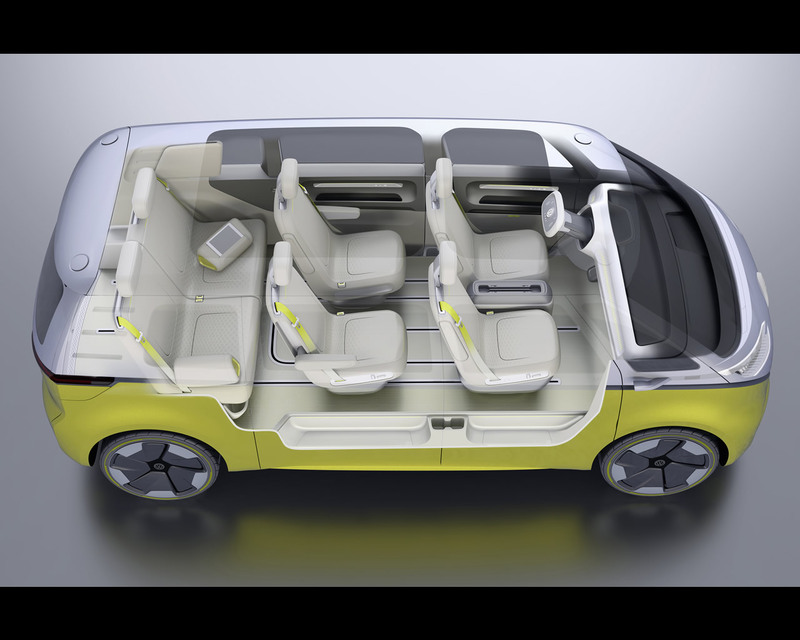 It too was revolutionary – a compact electric car that will launch in 2020 with driving ranges of up to 600 kilometers: it is the first car based on the MEB that will go into production, and the first Volkswagen concept car that can drive fully autonomously. The new I.D. BUZZ is now the first van to fully enable this functionality: a slight push on the steering wheel is all it takes to make the steering wheel retract to merge into the cockpit instrument panel and switch the I.D. 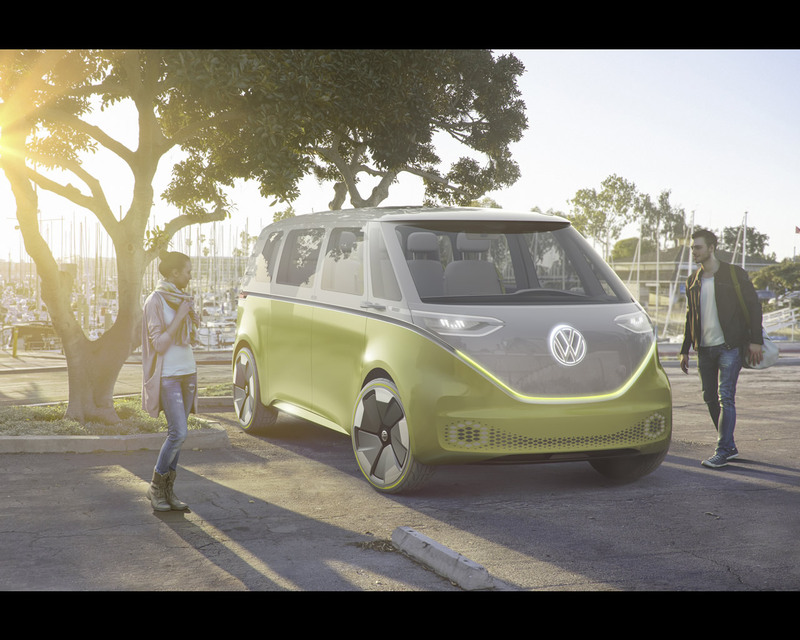 BUZZ over from manual control to the fully autonomous “I.D. Pilot” mode (conceivable starting in 2025). In this mode, the steering wheel is decoupled from the steering gear via a newly developed steering column system. 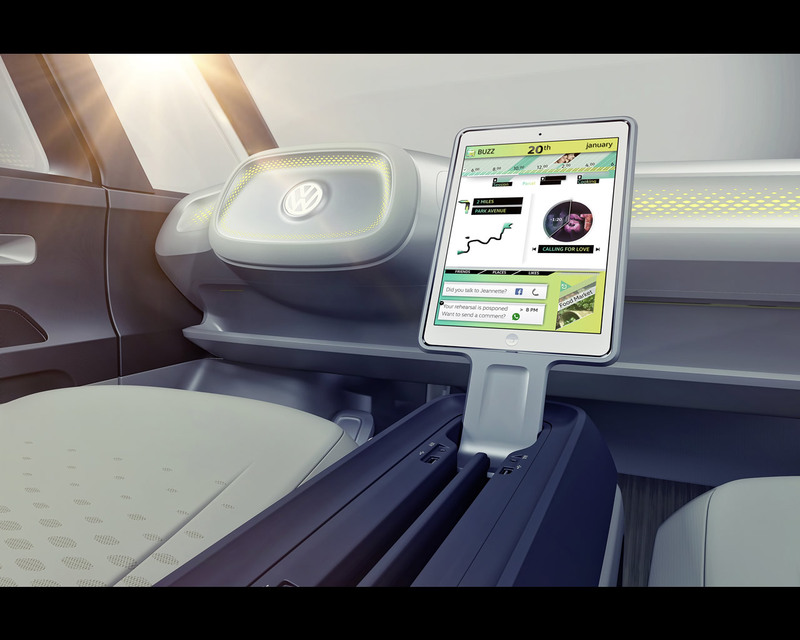 Then driver will be able to turn their seats towards the rear, facing their fellow travelers. Laser scanners, ultrasonic sensors, radar sensors, area view cameras and front camera acquire information about the surroundings, and other traffic data is received via the cloud. 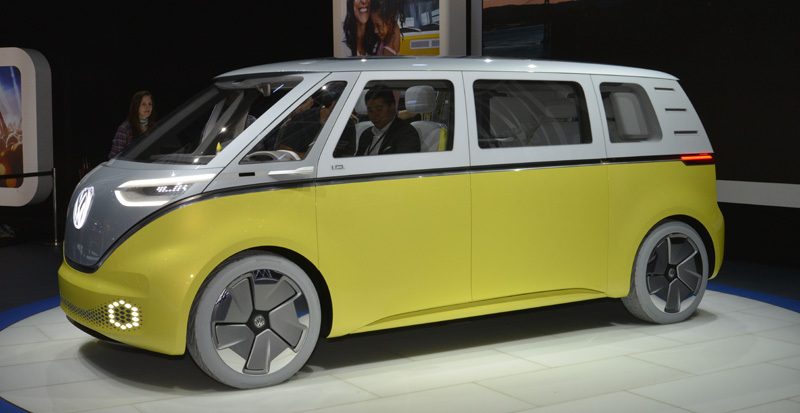 Microbus is a legend in the USA and Europe. Conceptual and technical product innovations – regardless of their subject area – are inconceivable without a design that is just as innovative. 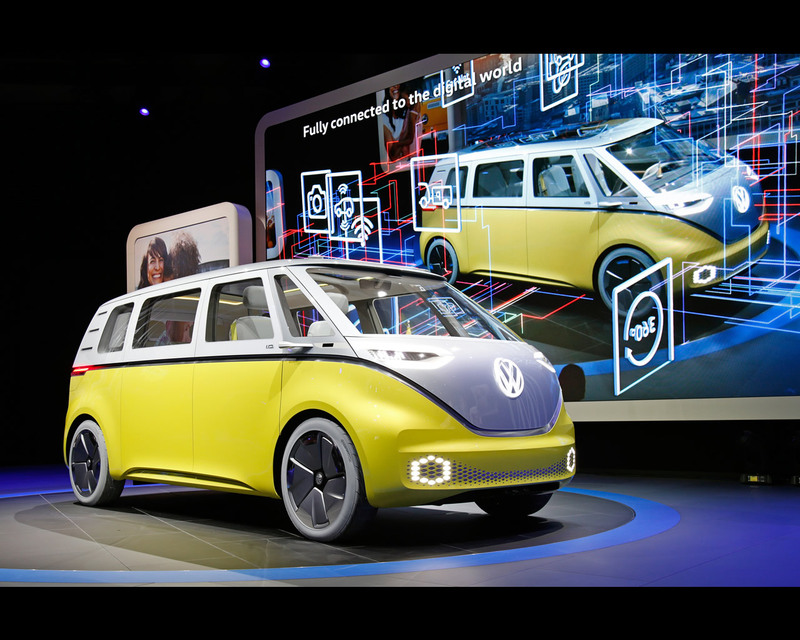 Therefore, Volkswagen is re-interpreting an iconic form of automotive design in the I.D. BUZZ: that of a van. 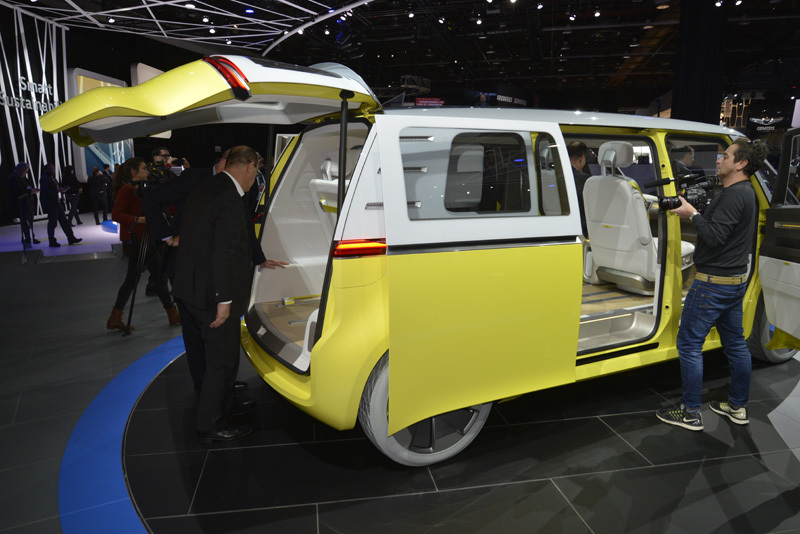 In all likelihood the most familiar van design is that of the Volkswagen icon that took on the unofficial name VW Bus – a vehicle of many names. 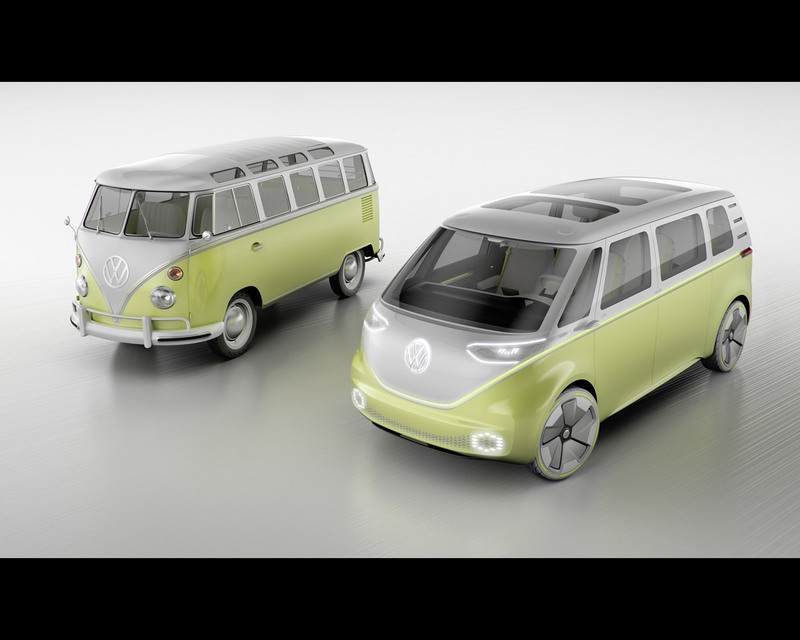 The Germans call the talented all-round bus the Bulli, North Americans refer to it as the Microbus. A global community. The odds are high that anyone who parks their bus anywhere between London and Lisbon in Europe is also always part of a community. The same is also true in the USA. Especially in Pacific hotspots like San Francisco, Santa Barbara and San Diego, there are parking areas teeming with vehicles from the older Microbus generations. Although the I.D. 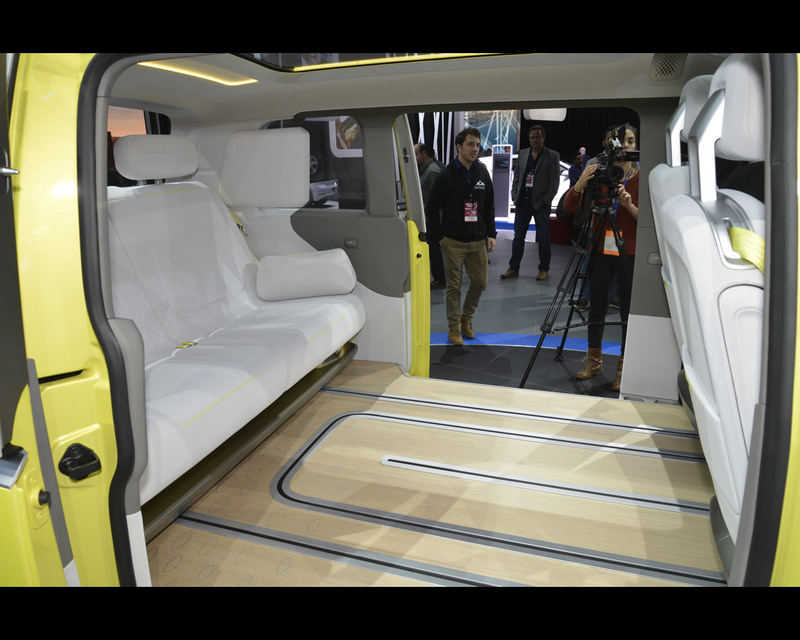 BUZZ is a new era van, it would mix in perfectly with its predecessors. High-tech front end. 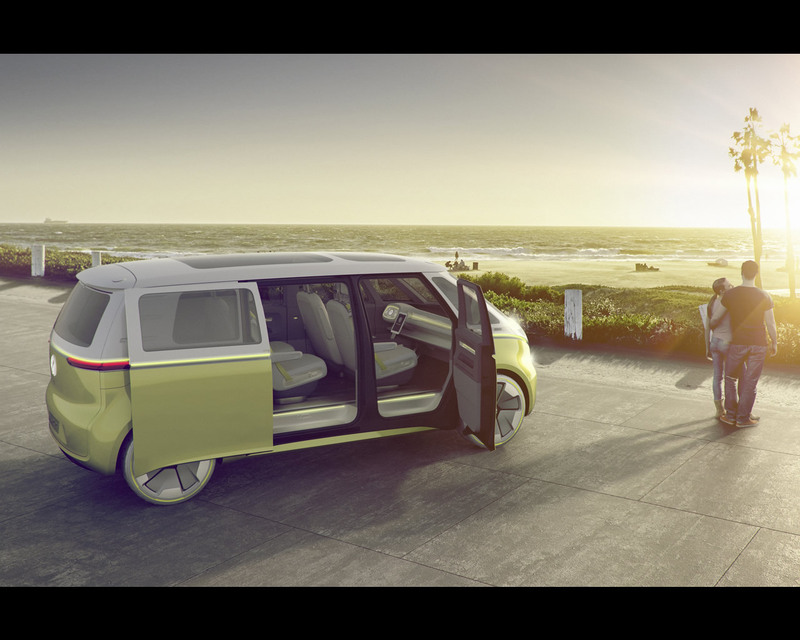 The best example of the interplay of familiar and new elements of the DNA chain is the front end with its characteristic ‘V’ and the very likeable ‘face’ – clearly a Bulli, or Microbus, but a completely new interpretation of it. Oliver Stefani: “Instead of the round headlights used in the original model, in designing the I.D. BUZZ we opted for slender LED systems, which not only turn night into day, but also interactively communicate – as eyes – with drivers and pedestrians.” Similar to the I.D., the bumpers also integrate a honeycomb design of matte aluminum; the outer honeycomb sections are illuminated. Every detail re-interpreted. Also defining its style are the extremely short and concise body overhangs. This applies equally to the roofline with its charismatic front overhang and three stylized air vent slots in the rear roof pillars – a small tribute to the legendary T1. Each detail has, however, been reinterpreted and implemented in a new context. Wrap-around ambient lights. A visually important feature and an expression of special attention to detail is the wrap-around ambient lighting that is basically the ‘chrome trim’ of a new era. It is actually an accent strip made of matte aluminum, but it is embedded in an ‘undercut’. Designers call this a sharp undercut. Indirect ambient lighting has been integrated into this full wrap-around undercut, which also forms the ‘V’ of the front hood. When it is dark outside, this creates a unique night design together with the two VW logos (front and rear) that are also backlit and the lighting elements in the front bumpers. Charismatic rear design. The I.D. BUZZ is also unmistakable from a rear perspective. Here the slender full-LED lights and large painted surfaces make up the iconic design. Striking: the tailgate that extends far down into the bumper and the resulting low load sill height of just 600 mm. 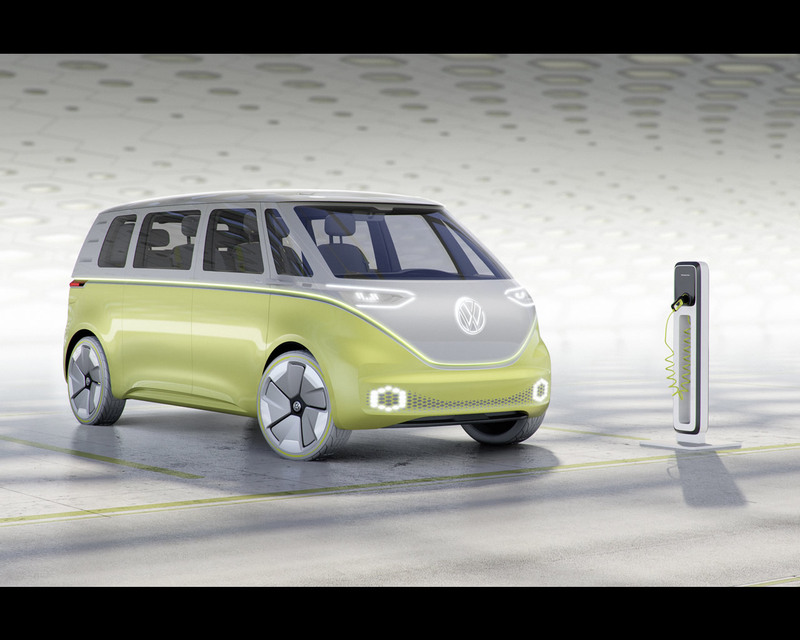 Incidentally, thanks to its compact electric drive, the I.D. 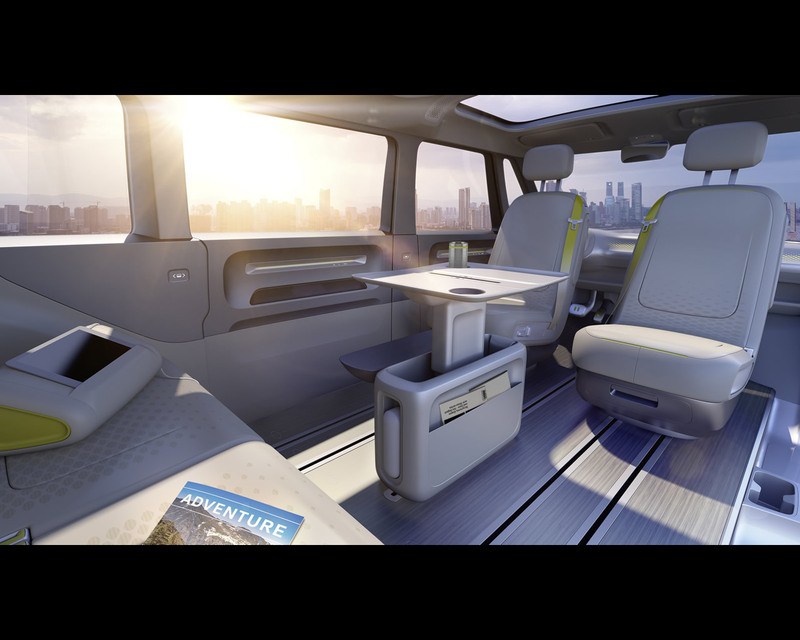 BUZZ not only offers a rear luggage compartment (660 to 4,600 liters), but also one in front (200 liters). All of the lids and doors feature a power opening function. Opening of the tailgate, front doors and rear sliding doors is initiated by a sensor solution from outside the vehicle. Thanks to the Digital Key, all the user needs to do is hold his or her hand over a marked area for entry. Insignia of electric mobility. There are clear design parallels to the I.D. shown in Paris. 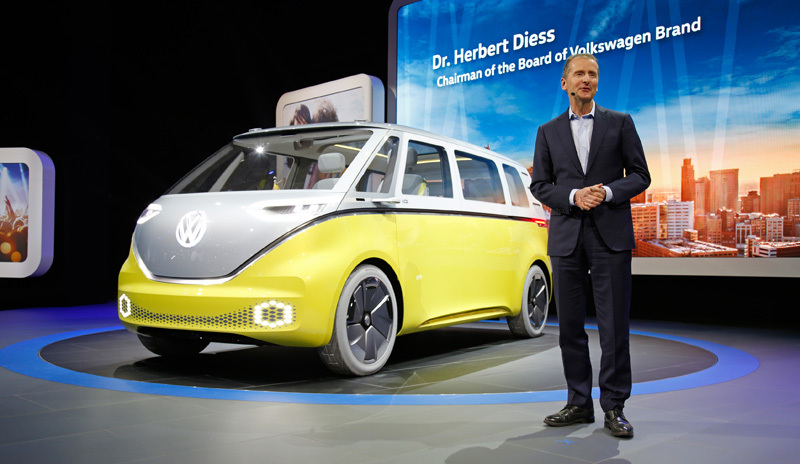 The front LED lights, wrap-around LED tail lights, bumpers homogeneously integrated into the body, side sills stylistically raised at the center of the door area, laser scanners on the roof and the look of alloy wheels – all of these elements combine to form the design insignia of the new Volkswagen electric mobility. Two-tone paint as tribute to the T1 icon. There is hardly any other car in the world on which classic two-tone paint looks better than on the Bulli / Microbus. That is why it is a ‘must’ for the new I.D. BUZZ as well. 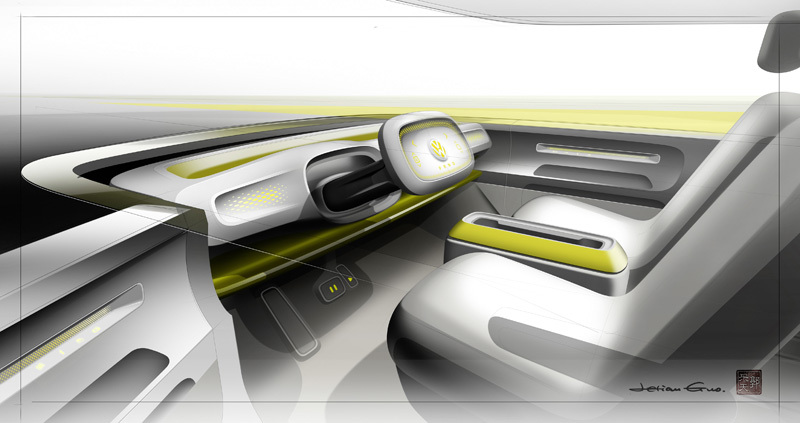 The car is painted in Silver Metallic above the concise seam that integrates ambient lighting. The surfaces beneath are painted in Cyber Yellow Pearl Effect. The yellow hue is also found on the sidewalls of the tires (235/45 R22). The 22-inch alloy wheels are painted in Galvano Gray Metallic. MEB changes everything. Like the I.D., the I.D. 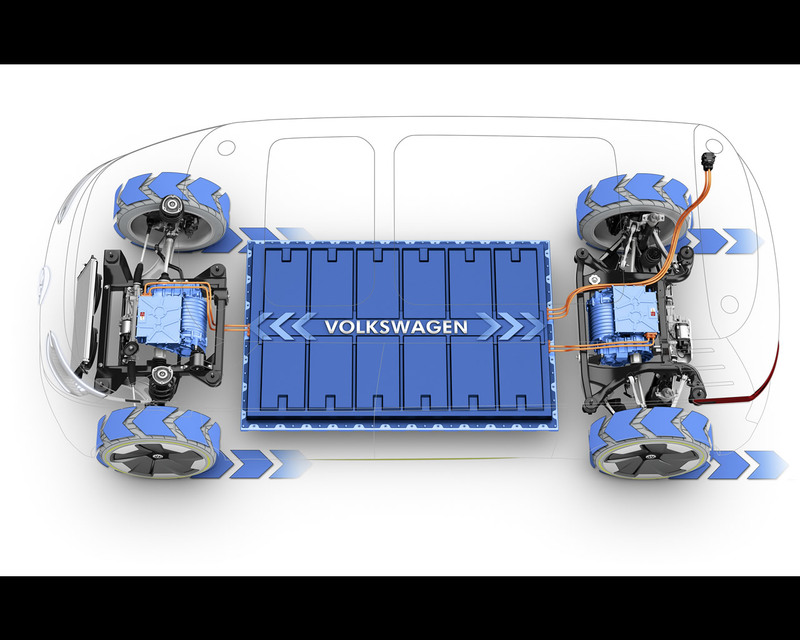 BUZZ being presented in Detroit is also based on the newly developed Modular Electric Drive Kit (MEB). 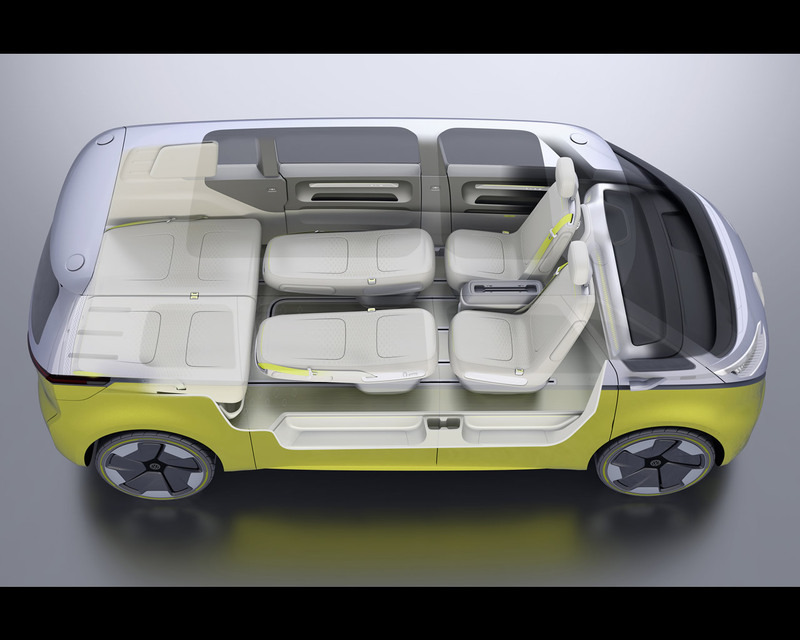 The future MEB models will be cars that will only be offered with pure electric drive systems. 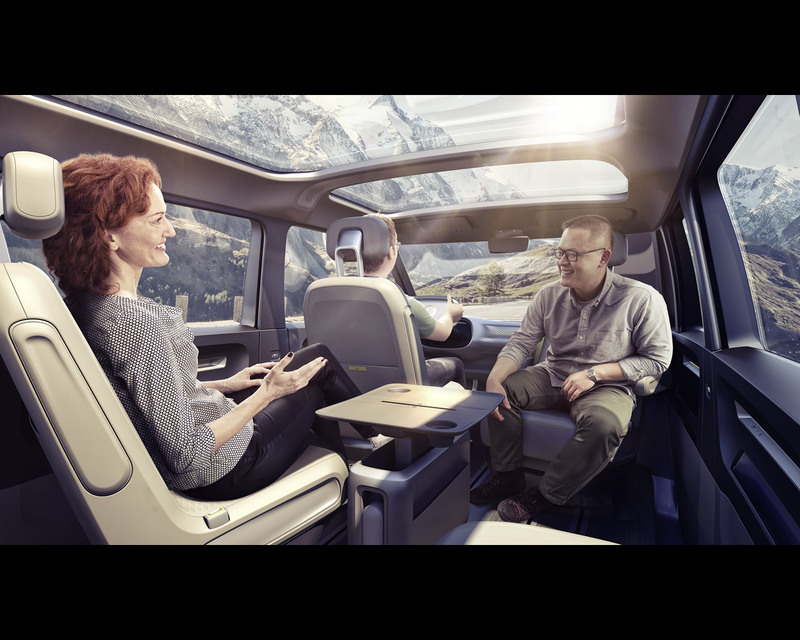 This design approach produces various benefits, in particular with regard to the package – the layout of the powertrain components, ancillary equipment and interior features. 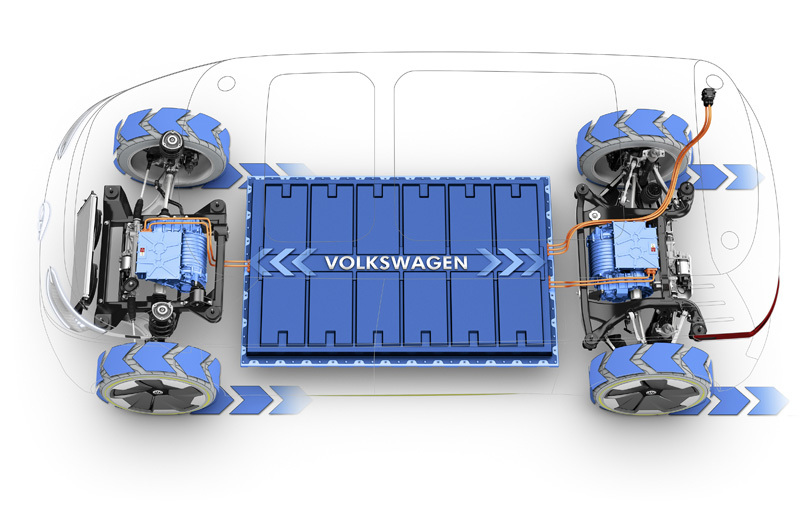 The zero-emission all-wheel drive system of the I.D. 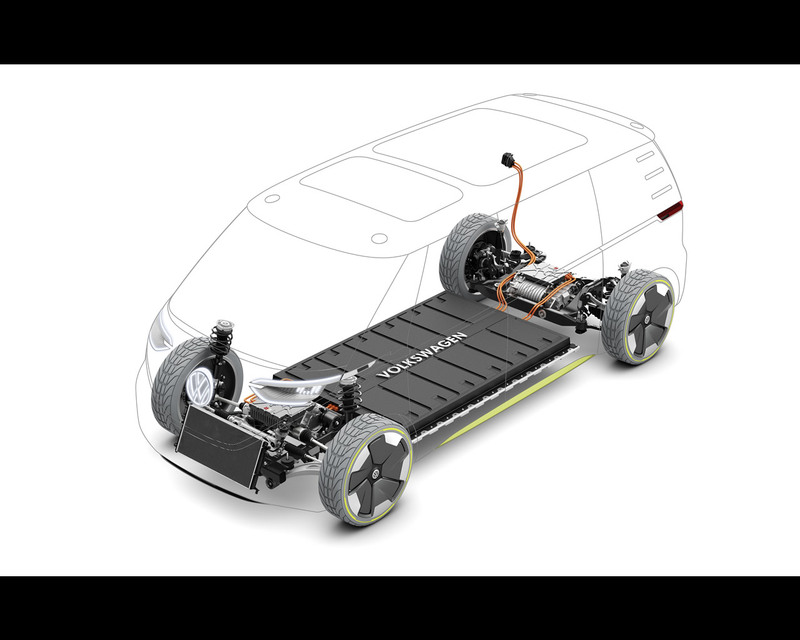 BUZZ consists primarily of an electric motor (150 kW) at the front axle, an electric motor at the rear axle (150 kW) as well as the power electronics, gearbox, a space-saving high-voltage flat battery mounted under the car floor and the ancillary equipment integrated in the front body.  Extremely long wheelbase of 3,300 mm.  Front body structure which, along with offering top safety properties, also enables a wide turning angle of the front wheels and – in combination with the steerable rear axle – a very small turning circle of less than 11 meters. 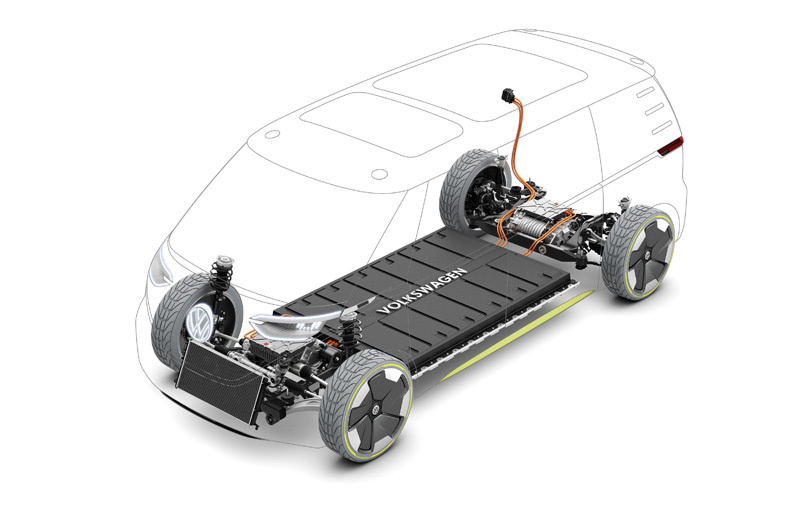  Low-profile lithium-ion battery integrated in the floor reinforces the basic vehicle structure, lowers the vehicle’s center of gravity, produces ideal axle load distribution and low lateral acceleration.  Front suspension has stiff, decoupled subframe and integrated all-wheel drive.  Multi-link rear suspension has integrated drive unit and decoupled subframe at rear axle.  Suspension layout offers optimal handling and ideal acoustics.  Air suspension at the rear axle and electronically controlled dampers at both axles deliver maximum comfort.  Wheels 780 mm in diameter and 235/45 R22 tires offer optimal ride comfort. This is a world premiere – as mentioned, the I.D. 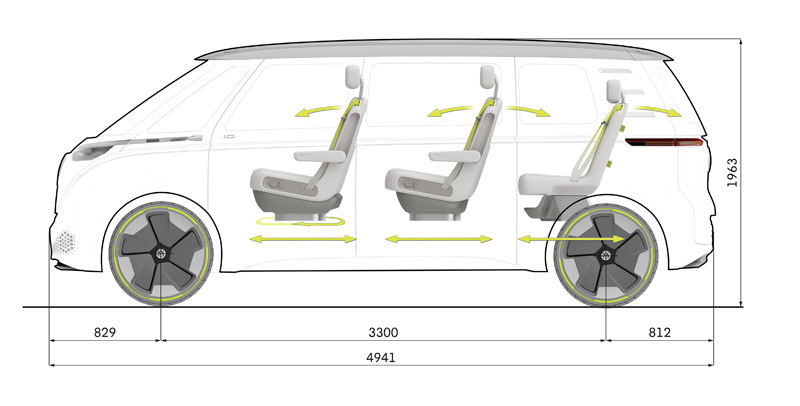 BUZZ is the first van that a person can have drive fully autonomously. It is very easy to activate the “I.D. Pilot” mode: as soon as the driver lets go of the steering wheel, the I.D. BUZZ assumes control. The ambient lighting then switches from a white light (“Drive”) that facilitates concentration to mood lighting that is warm and relaxed. 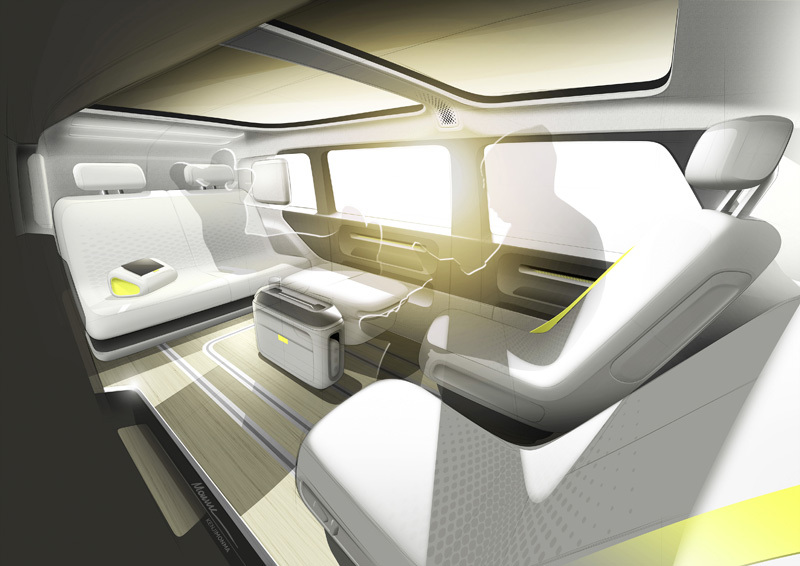 At the same time, the distribution of ambient lighting is extended to the rear seating area. Simultaneously, the status of the I.D. 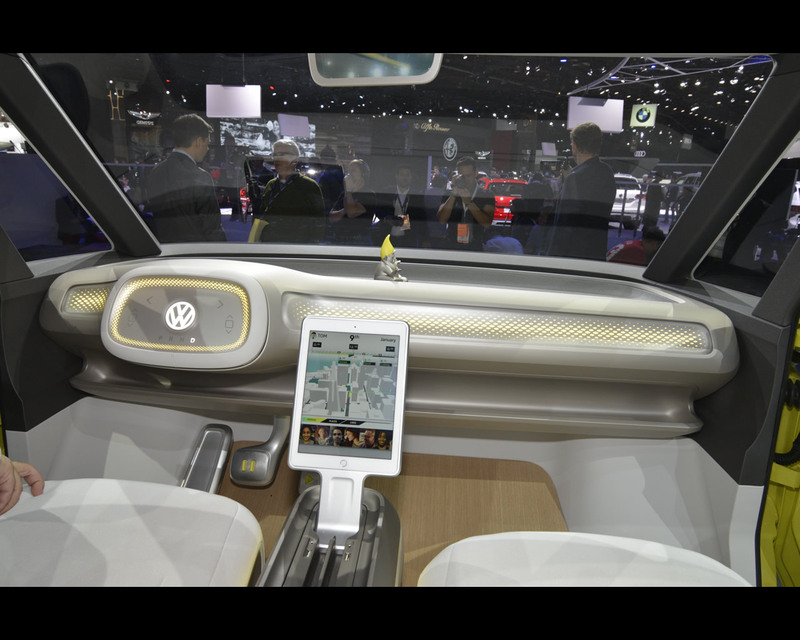 BUZZ can be seen at all times on the tablet and the AR Headup Display. Four laser scanners on the roof. By this time, the zero-emission van has already activated its laser scanners. Four of them extend from the roof in “I.D. Pilot” mode. The cleanly styled roof sensors call attention to the fully autonomous mode by indirect lighting. The I.D. BUZZ is not only able to detect other road users by its laser sensors, but also with the assistance of ultrasonic sensors, radar sensors, side area view cameras and a front camera. Traffic data is also continually acquired and compared with the vehicle data via the cloud.